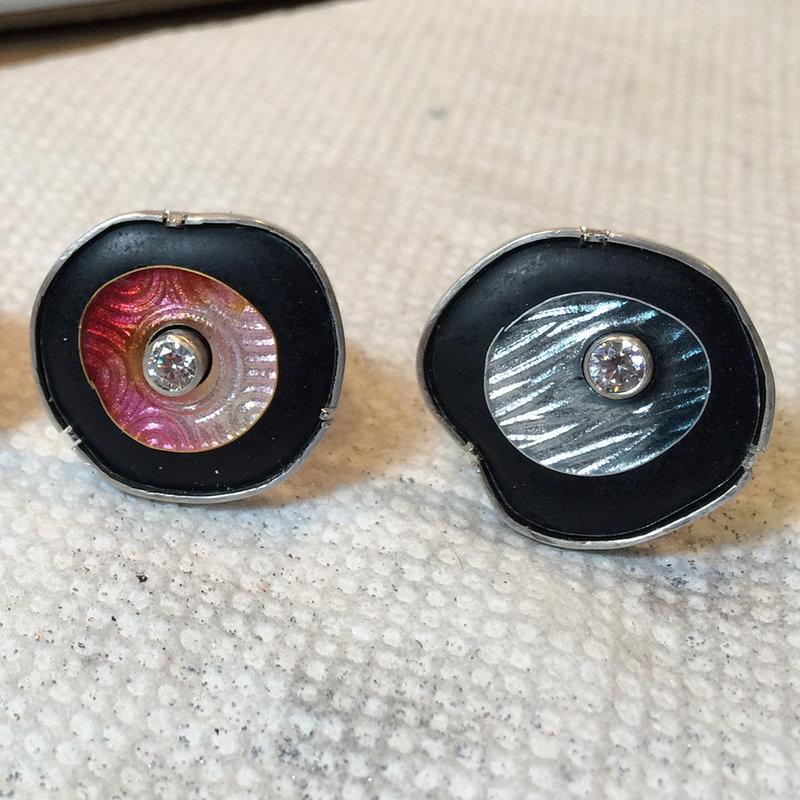 So you want to have a bezel-set gem in the center of your enamel? You create an enamel that is a doughnut; that is, it has a hole in the center for the gem. 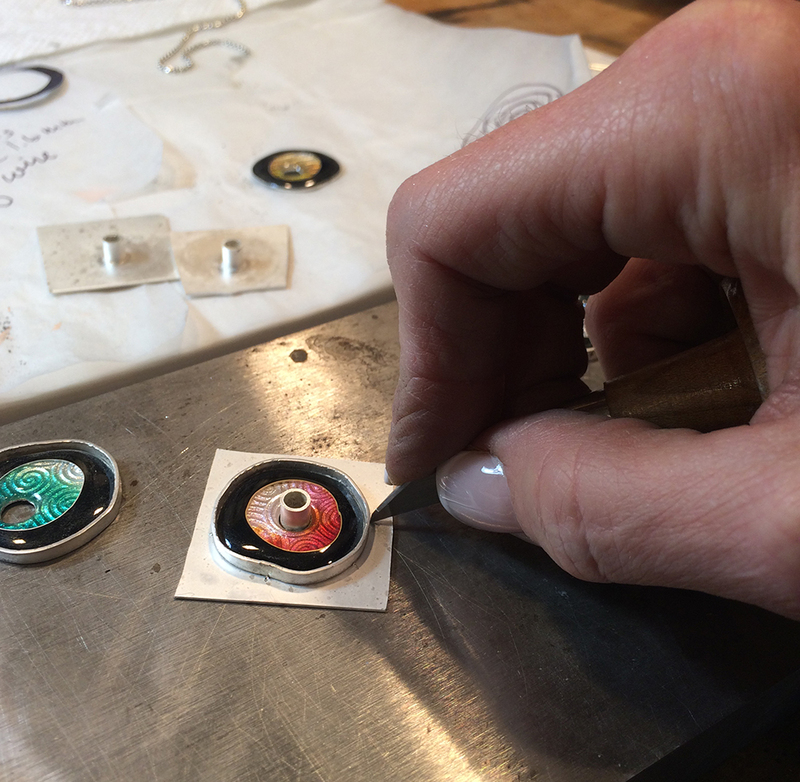 You solder two bezels onto a back sheet—one for the center stone and one for the enamel. But, when you try to set the enamel, it doesn’t fit. Maybe the bubbling flux moved your bezels a tiny bit during soldering. How can you prevent this from happening? The answer is to use a graver to raise tiny beads around the bezel so that it does not move during soldering. 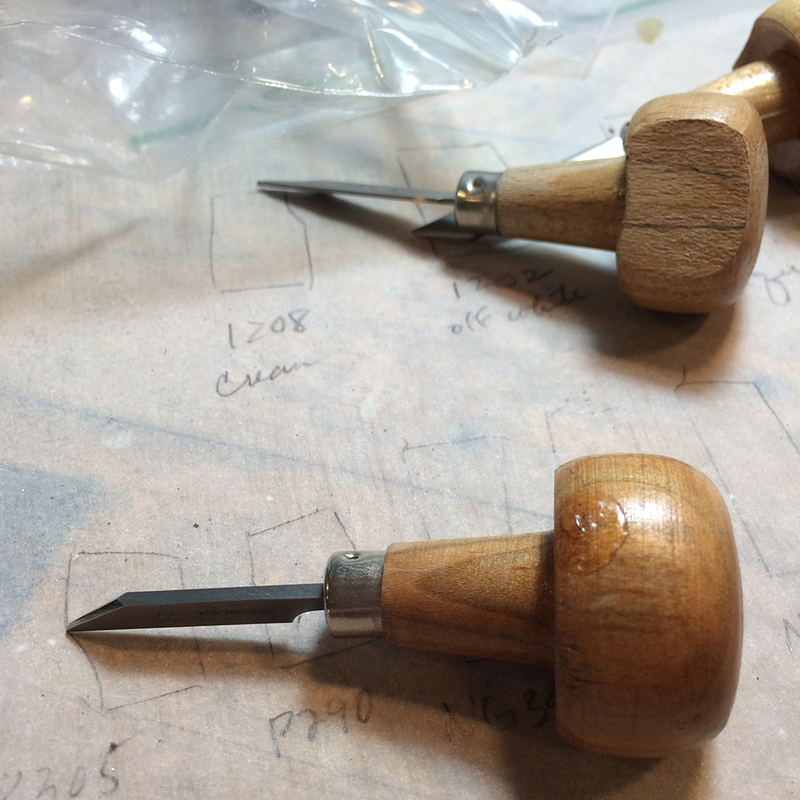 If you’re not familiar with gravers, the simplified definition is that it is a sharp steel tool that is used to move, or remove, tiny bits of softer metal. In this case, I positioned my enamel with bezels in place on the back sheet and marked the position with a Sharpie. I removed the enamel and outer bezel and soldered the inner bezel in place. The positioning when soldering at this point doesn’t have to be precise. 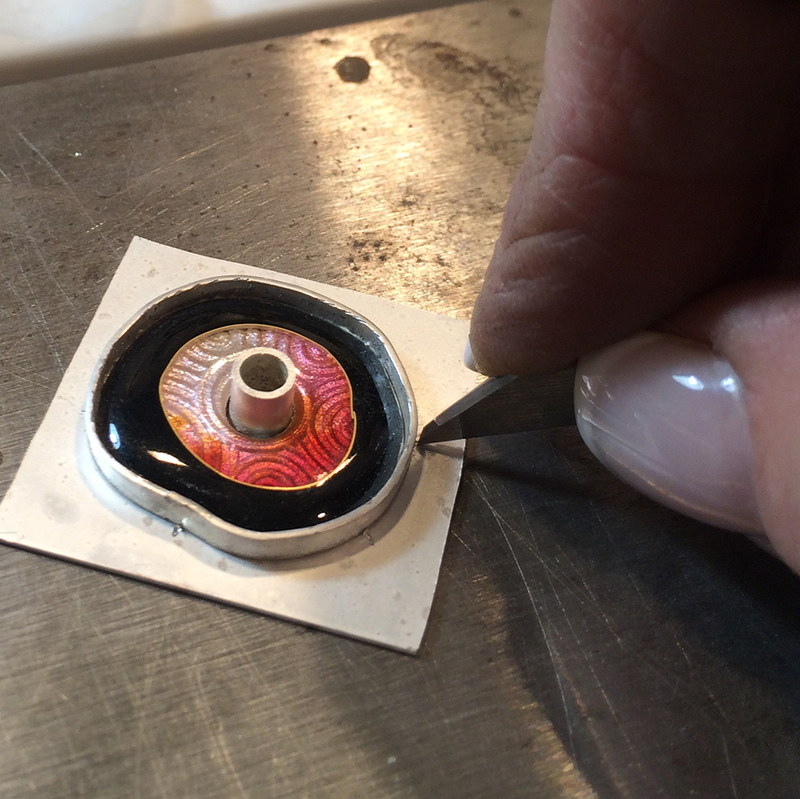 Next, I reposition my enamel doughnut and outer bezel onto the back sheet with the inner bezel poking up through the hole. 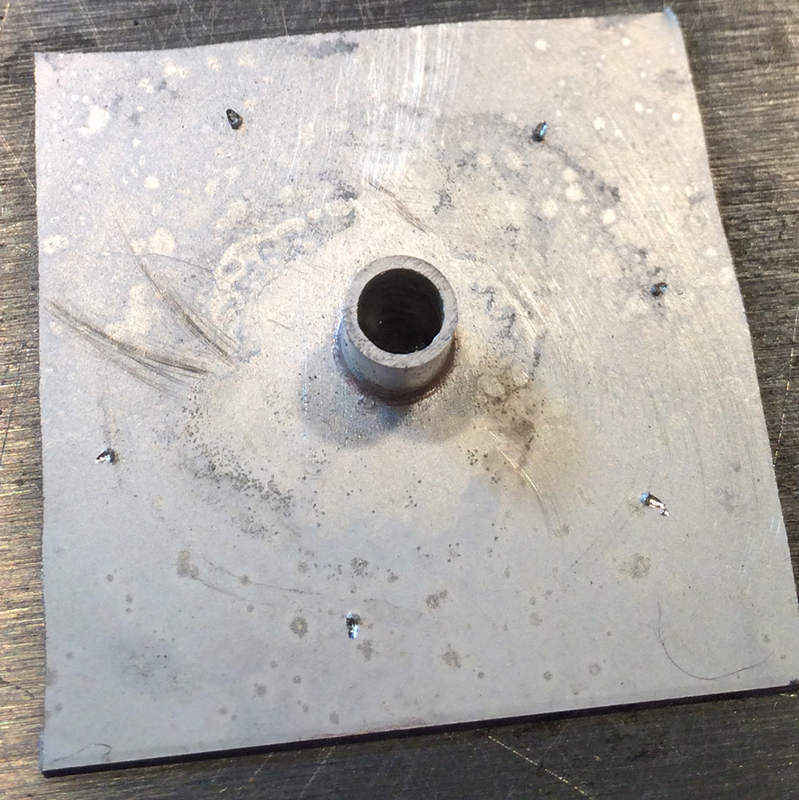 I take my graver and, starting about one millimeter away from the outer bezel, I dig the graver into the silver back sheet, pushing toward the center of the bezel. In this way, I push a little bunch of metal that ends up very close to the bezel. You can see from the photo that behind my beads are tiny gouges. You should raise enough beads around the bezel so that no movement takes place during soldering. Remove the enamel, taking care to keep the bezel in place. If the bezel does move, carefully reposition it, and then solder. Posted in Metalsmithing and tagged enamel ring, Metalsmithing, soldering. Bookmark the permalink.